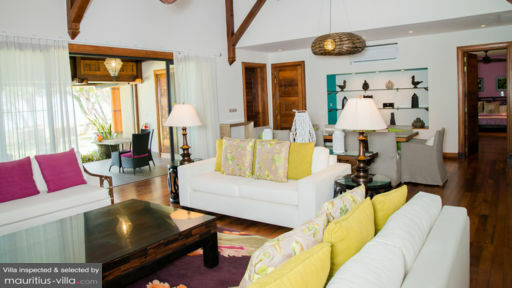 Tucked away in the charming village of Poste Lafayette, Villa Tiara places you within driving distance of the city capital of Port Louis and tourist hub of Grand Baie. Boasting a decadent interior with all the comforts of home, this villa is perfectly-appointed to comfortably accommodate larger groups of up to ten people. In fact, thanks to its pristine setting, this villa can also double as an excellent wedding destination. 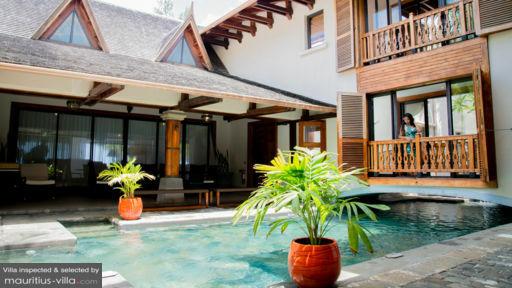 Best of all, you will be treated to a variety of services that will render your stay in Mauritius even more enjoyable. The five bedrooms of Villa Tiara are perfectly appointed to accommodate up to ten guests. Enjoy sweeping views of the ocean from the master bedroom which also includes a hammam and a private balcony. All bedrooms provide an en-suite bathroom each, perfect for refreshing in all intimacy. Three of the guest bedrooms are equipped with queen-sized beds, while the master and the first guest room come with a King-sized bed each. Upon request, it is possible to set up four additional single beds. The outdoor areas of Villa Tiara open directly onto a stretch of silky beach which means that you merely need to cross through the garden to savor the feel of the sand under your toes. 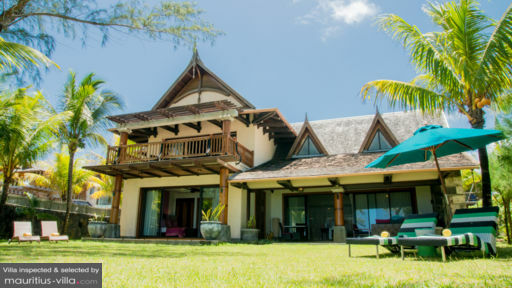 With swaying palm trees and lush tropical foliage, this villa also boasts a sheltered veranda where you can sit back and relax with your loved ones. Put your feet up and relax with a fresh beverage as you enjoy the gentle slosh of the waves against the shores. Outside, you will also find a private slated pool that can be heated upon request and for an extra fee. If you want to host a pool party, rest assured that there’s also a Jacuzzi area in which you can luxuriate and let your troubles melt away. Additionally, the garden features an outdoor shower, umbrellas and deck chairs for when you want to work on your tan. With a wine cellar fridge, Villa Tiara provides a fully-equipped kitchen where you can work on your culinary skills when you don’t want to eat out. In the kitchen, you will find a large counter, counter stools, crockery, cutlery, utensils, electric kettle, toaster, coffee maker with Nespresso capsules, dishwasher, hotplates, oven, microwave and more. To savor the fruits of your labor, step into the beautifully-furnished dining area that can seat up to 14 guests. An expansive living area provides a 50” television with satellite channels so you can keep up with your favorite shows. There’s also a surround sound system, Nintendo Wii console and a Blue Ray DVD player. The villa also offers a hammam area. Focus on enjoying your holiday in Mauritius to the fullest thanks to the assortment of complimentary services such as daily cleaning and laundry. The general manager is on site six days a week and guests are also treated to express check-in and check-out. Barbecue equipment are available and guests can borrow bicycles or kayaks. Upon request, you can hire paid services such as butler services, excursions and activities, in-house cook and waiter. A short drive from Villa Tiara is found the tourist hub of Grand Baie, where you will find several nightclubs and restaurants. During the day, Grand Baie is also an excellent shopping destinations, especially if you’re looking for souvenirs and Mauritian artefacts. A large spacious well appointed villa. Extremely good staff, who maintain the property on a daily basis. Very accommodating for your children and babies. Just a great holiday spot. Sheltered swimming pool, Beach at the end of the garden. A fifteen minute drive to closest supermarket. Accommodated us with a late check out. We were here for a birthday and the staff went the extra mile decorating the main bedroom. Private chef was available for a dinner that was superb.